Charlie Kuntzman was skeptical when he walked into his first Diabetes Self-Management class last November at Taylorville Memorial Hospital (TMH). Janelle Cornell, RD, LDN, clinical dietitian, has worked for TMH nearly 24 years. She teaches the Diabetes Self-Management class with Sarah Tierney, RN, CDE. The classes are designed to help people manage their diabetes, whether they are newly diagnosed or have been diabetic for a long time. 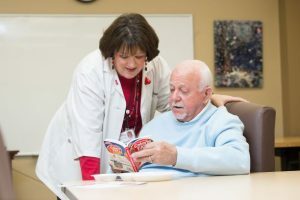 The eight-hour class (divided into four two-hour weekly sessions) includes information about diagnosis, treatment, medications, diet and nutrition, lifestyle modifications and glucose monitoring. The colorful balanced plate, which illustrates on a real plate how many non-starchy vegetables, grains/fruits, protein and dairy to have in a serving, made a positive impression on Charlie during the class. He also made immediate changes to the timing of his insulin each day. Small class size helped set a tone in which Charlie was comfortable asking questions and sharing about his situation. Janelle and Sarah tailor the classes to the individuals who are in the class. In Charlie’s case, they also zeroed in on his sodium intake and practical ways to cut back on how much salt he was consuming. Over the holiday season, Charlie lost more than 20 pounds. He was intentional about his portions – especially the pumpkin pie at Thanksgiving! His knees and his back aren’t bothering him as much, and his energy levels have increased. An avid deer hunter, he looks forward to climbing his deer stand next hunting season – something he didn’t have the energy to do this past fall. Want more information about Diabetes Self-Management classes offered through Taylorville Memorial Hospital and Memorial Health System? Contact Janelle Cornell at cornell.janelle@mhsil.com or call 217-824-1840. For classes through Abraham Lincoln Memorial Hospital, call 217-605-5536. For classes through Memorial Medical Center’s Weight Loss & Wellness Center, call 217-788-3948. For classes through Passavant Area Hospital, call 217-479-5511.